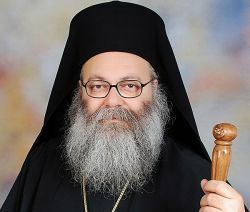 After the communiqué released on April 23rd, the Greek Orthodox Patriarch of Antioch John X, at the beginning of the Orthodox Holy Week, has issed the following Pastoral Letter, which is sent to “all the brethren, the shepherds of the holy Church of Antioch”. We report it as a renewed sign of love for this Church, while we persevere in prayer for the two kinapped bishops. I address you today, at the end of Great Lent and the beginning of Holy Week, and at a time when we are being surrounded by much pain and suffering. Throughout our Antiochian lands, dangers threaten our homes, and political conflicts storm our countries. As a result, man's livelihood, dwelling, and even life are at risk. We are tried every day by death or abduction, and our latest plight is the recent kidnapping of our beloved brothers, Bishop Paul Yazigi, Greek Orthodox Metropolitan of Aleppo, Iskenderun and dependencies, and Bishop John Ibrahim, Syriac Orthodox Metropolitan of Aleppo, and the killing of the Deacon who was accompanying them. I share the pain felt by a large number of believers in our Church as a result of these difficult circumstances. I strive with my brothers, the members of the Holy Synod, to lessen the impact of these conditions on our faithful and all citizens. This is an essential part of our Christian witness. We, however, refuse to accept what man is undergoing today. We are working in that our rejection of this situation reflects the tenets of our beliefs. We reject this situation and condemn it. Since we are the children of the resurrection, we are not afraid of whoever takes violence as a way to achieve his purpose. To be killed, or kidnapped, or to have our institutions destroyed, will not change our resolve to uphold our civil life and our coexistence; to cling to our homeland and to seek the reign of justice and rights in our homelands. Therefore, each and every one of us, whether in the Antiochian motherlands or abroad, is invited to express his concern and personal rejection of the recent course of events, aside from any political realignment. Humanity is the object of Christianity, for our Lord was incarnated for our salvation.